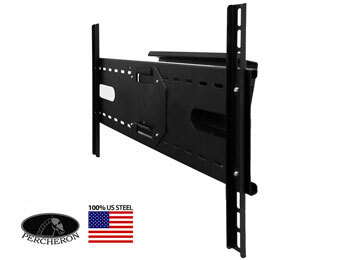 LARGE UNIVERSAL PIVOT WALL MOUNT Includes PR-F730CM Bracket. Adjusts to fit most 30" to 65" LCD or Plasma TV's and monitors with VESA bolt pettern of 730mmx480mm. Mounts in portrait or landscape configuration. Flat-panel tilts -5°/+15° (limited by size of TV and angle of rotation). The PR-PA730T 's short extension allows Pans of 20° left and right (limited by size of TV and angle of tilt). 210 lbs Recommended Max Load.